Film and Video Editing Theory offers an accessible, introductory guide to the practices used to create meaning through editing. 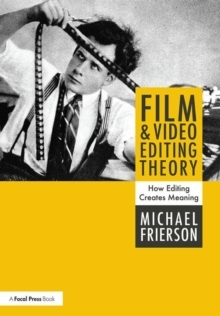 In this book, Michael Frierson synthesizes the theories of the most prominent film editors and scholars, from Herbert Zettl, Sergei Eisenstein, and Noel Burch to the work of landmark Hollywood editors like Walter Murch and Edward Dmytryk. In so doing, he maps out a set of craft principles for readers, whether one is debating if a flashback reveals too much, if a certain cut clarifies or obscures the space of a scene, or if a shot needs to be trimmed. The book is grounded in the unity of theory and practice, looking beyond technical proficiency in a specific software to explain to readers how and why certain cuts work or don't work.